My nine year old son was asking what he could have for breakfast that would be healthy. This is pretty much the simplest and healthiest recipe that I could design that a nine year old can put together unsupervised. I’m teaching him to just put some frozen spinach, eggs, cream and cheese into a microwave bowl. Eggs are a wonderfully complete protein. Cheese and cream add to the taste as well as adding in other proteins and fat not in the eggs. Spinach is such a great superfood with so many micronutrients while being low in net carbs due to the high fibre content. You can add coconut oil or butter to get extra good fats into your meal to create something wonderfully indulgent, nutritious and that will be gentle on your blood sugars. If you’re short on time frozen spinach is quicker than using fresh spinach. I figure if you’re going to skip the spinach because it takes too long to fry up, then it’s better to go with the frozen option. I will use frozen kale sometimes too which gives a slightly different taste and texture. If I’m cooking for the family and have bit more time I’ll do the fresh spinach in the fry pan. If I’m putting this together for the family before we run out the door in the morning I will use some frozen spinach or kale. With only 7g net carbs and heaps of well rounded nutrition (in terms of both vitamins and minerals and amino acids) it’s pretty hard to go wrong with this for any meal. The stats for a 500 calorie serving are shown below. 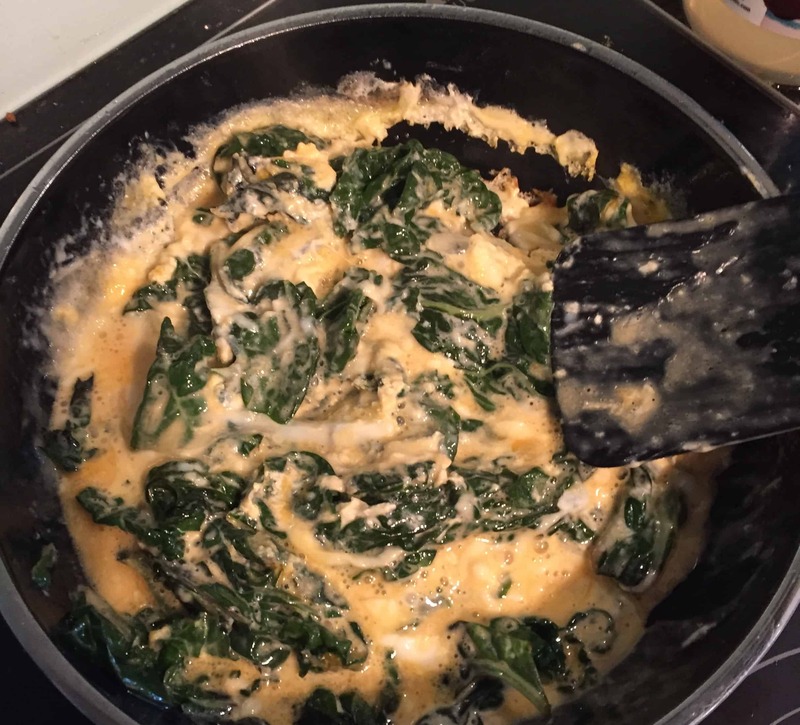 The net carbs are low, the fibre is fairly high with the spinach and most of the insulin requirement is for the slower digesting protein rather than the carbohydrates. The more spinach the better if you want to maximise the nutrition. The highest overall score occurs when we we use 700g of spinach. Though this may be pushing the limits of optimising nutrition, not necessarily palatability or eating pleasure. Since working through the nutrition analysis comparing different meals, this meal has basically become our preferred go to meal, which you can make as simple or as complex as you want. If you’re an insulin dependent diabetic you could use this as a regular meal and refine your insulin dosing based what you see on your BG metre after the meals. I’ve run the analysis below with the kale rather than the spinach. As much as people rave about kale, it actually does not do as well on the nutrient balance score as spinach! Spinach scores better in both the nutrient completeness and the amino acids. Kale also has more total carbohydrates and less fibre which makes less diabetic friendly. You are amazing…and helping so many people, like myself, who would or could never figure this stuff out ! I have recently put my T2 insulin dependant (for 26 years) diabetes into complete remission using LCHF/IF from ‘ Dietdoctor.com ‘…they are almost as helpful as you ! Is there any way in the world you could put your information on Pinterest so older folks like me (just turned 64) could simply pin it and study it over and again later ? It takes me several readings to absorb anything and I know no other way to save it via my iPad ! Many, many thanks for your wonderful work and help !